The Newsroom: Why did the Aaron Sorkin show fail? 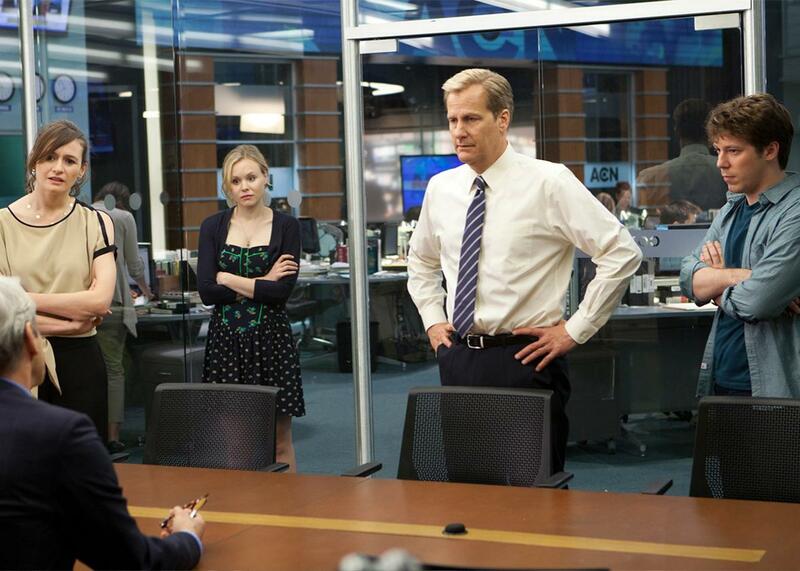 Why Did Aaron Sorkin’s Newsroom Fail? A scene from The Newsroom. Somewhere along the line, Aaron Sorkin (as a television writer) lost his sense of humility, and his shows have been far worse for it. Sports Night was a fairly lightweight show that was at heart a workplace comedy. The office workers were rather more competent than anyone you’d find in The Office, and they took their jobs seriously, but at the end of the day, it was a workplace comedy, and it didn’t really aspire to be anything more than that. It wasn’t there to teach you—it was there to entertain you, and while it did occasional hit hot-button topics, it didn’t lose sight of its primary goal. Sorkin had by that time written the screenplay for The American President, a Michael Douglas film released in 1995, for which he’d compiled a huge amount of material that he hadn’t gotten to use. This all went into his largest television hit to date, The West Wing. The original conception of The West Wing involved very rarely seeing the president, with the White House deputy communications director being the main character, but this idea was tossed after the first episode and with good reason. But where a show about the deputy communications director could conceivably be about wacky hijinks (e.g. accidentally sleeping with a prostitute), being about the president and his staffers pretty much demands actually engaging with issues on a regular basis. He’d still designed the show to be about the people rather than the issues, so it was still quite entertaining, but it was a pretty delicate balancing act. Still, for the four seasons he ran the show, Sorkin did generally keep his balance, and I’ve watched each episode from those four seasons multiple times as a result. His follow-up was Studio 60 on the Sunset Strip, a show that was ostensibly about the behind-the-scenes goings-on at a Saturday Night Live–like sketch show. Unfortunately, Sorkin wasn’t content to go back to writing the kind of show he’d had with Sports Night, so Studio 60 ended up being about what was wrong with America, what was wrong with television, what was wrong with Sorkin’s ex-girlfriend who he barely fictionalized in the show, what was wrong with Sorkin’s co-workers from over the years, what was wrong with kidnap and rescue specialists operating in Afghanistan, and so forth.The pilot was actually pretty solid, but Sorkin’s need to rehash arguments he’d had with other people made the show feel unnecessarily and unintentionally mean-spirited, and his didactic monologues on important issues were at best irrelevant and at worst ridiculous. The show died an ignominious death after a season. And now we get to The Newsroom. With The Newsroom, Sorkin returned again to the theme of TV production, but rather than making it a television show about something lightweight like sports or sketch comedy, he made it about the evening news. This gave him the opportunity to have the serious topics of conversation he’d developed a taste for with The West Wing, while at the same time operating in a milieu that he knew at least something about, a la Sports Night. This really should have been ideal, especially considering that most of the limitations provided by American network broadcasting were removed by putting the show on HBO. For one thing, Sorkin was still more interested in teaching than entertaining, which led to the really unfortunate choice in the first season of making every episode about how the ideal news team would have covered a story as opposed to how the real-life media did cover it. The show had to be retooled for the second season to stop doing this, which was a good thing because watching someone Monday morning quarterback can be a profoundly grating experience. This doesn’t do such a good job of explaining Sorkin’s reliance on stock characters in writing the show, though. I don’t mean that the characters came straight out of a commedia dell’arte troupe, but they did come straight out of Sorkin’s earlier works. Mackenzie is all but a recycled Dana Whitaker, Charlie’s Isaac Jaffee or Leo McGarry as the case may be, Will is a nastier Dan Rydell or Matt Albie. You don’t notice this if you haven’t seen what Sorkin had done before, but many people had. The first season required a retooling of premise, and the second season was where the show stopped being about how Sorkin would have covered news stories if only he’d had a time machine. Unfortunately, the second season itself is pretty damn weak, with the overall story hinting at the sainted news team having screwed up massively and facing serious consequences for it—and then turning out to be how someone who wasn’t really part of the team fouled up and how everyone else was nobly willing to fall on their swords. The hinted story is one of moral complexity and at least would have showed some fallibility on the part of the news team, some fallibility that frankly Sorkin hadn’t really been willing to demonstrate except in the context of telling a joke. The second is the further canonization of people who’d been overexalted to that point anyway. It’s a cop-out of an ending. Truth be told, I didn’t watch the third season, so I can’t really comment on it. The reviews of the penultimate episode were withering, to put it mildly, but after two deeply flawed seasons, both of which came out to Sorkin telling you how the news should be reported with the benefit of hindsight, I didn’t really feel like I was missing out. But much as it seems that I’m savaging Sorkin’s work, I do rather appreciate it. I can come up with episodes from each show that are worth watching, but Studio 60 was an outright failure, and The Newsroom wasn’t altogether too much better barring dramatic improvement in the third season, improvement that, based on episode synopses, doesn’t appear to have taken place. And what makes this all even more frustrating is that Sorkin’s film screenplays don’t fall victim to the same flaws. A Few Good Men, The American President, and The Social Network are each excellent movies that don’t show Sorkin retreading like crazy. They put the strongest focus on story, they’ve got strong characters, and they’re not like sitting in a lecture hall. Television series: What’s the future of T.V shows? Television: What are the most and least realistic aspects of Silicon Valley (HBO)? The Newsroom: Is the portrayal of women in The Newsroom problematic? Update, Oct. 5, 2015: A paragraph in this post has been updated for clarity.